A treasure trove of reggae, rocksteady, and blue beat work from the late 60s – all of it originally released under the guidance of producer Dandy – also a reggae artists of his own, with roots in Kingston, and working here with a big impact on the UK scene! 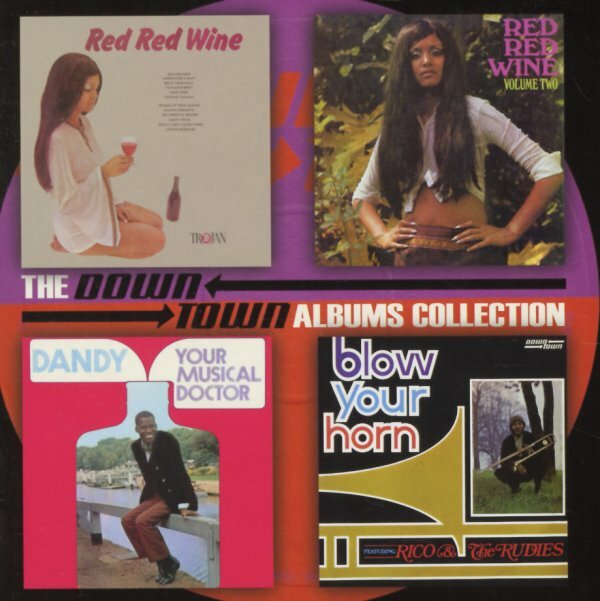 The albums here were all originally issued on the Down Town imprint – a small sub label that Trojan Records gave to Dandy for his own projects – which resulted in the two killer compilations Red Red Wine volumes 1 and 2 – a great overview of some of the strongly soul-influenced sounds that were bubbling up in London at the time. Dandy himself is one of the key artists on the collection – and titles include "Move Your Mule", "I'm Your Puppet", "Reggae In Your Jeggae", "Got To Come Back", "Raining In My Heart", and "Can't Get Used To Losing You" by Dandy – plus "Red Red Wine" and "I'm Gonna Give Her All The Love I've Got" by Tony Tribe, "Someday We'll Be Together" and "Love Me Tonight" by Audrey, "Lover's Question" and "Spreading Love" by Gene Rondo, "Lead Them" by Desmond Riley, "Games People Play" by The Israelites, and "Song Byrd" by Lyndon Johns. CD2 begins with the Trojan classic Blow Your Horn by Rico & The Rudies – a classic early album from Rico – the legendary Jamaican trombonist who's gotta be one of the few people who can pose with his instrument and still look pretty badass overall! That quality also comes through in Rico's music – a famous lead trombone sound on countless Jamaican recordings from the ska years onwards – really given some great time here in the spotlight on a set of tunes that soar out with lots of rough rocksteady rhythms! Rico blows strongly and soulfully – on titles that include "Rico's Message", "Niyah Man", "Caribbean Serenade", "Jumping The Gun", "Mighty Dan", "Session Begin", "Biafra", and "Quando Quando" – and the album also features some guest appearances on "The Lion" by Dandy, and on "Muma Muma" by The Israelites. Last up is Your Musical Doctor – a full album with Dandy as the lead singer on his own – with titles that include "Touch Of Poison", "Everybody Loves A Winner", "Gumption Feeling", "Meeting Over Yonder", "Here I Go Again", "Come On Home", and "Run Girl". 2CD set features 51 tracks in all – with a few more bonus tracks too! © 1996-2019, Dusty Groove, Inc.